This is an interesting and intelligently conceived program of 20th century Russian compositions for string quartet, but it promises slightly more than it delivers. 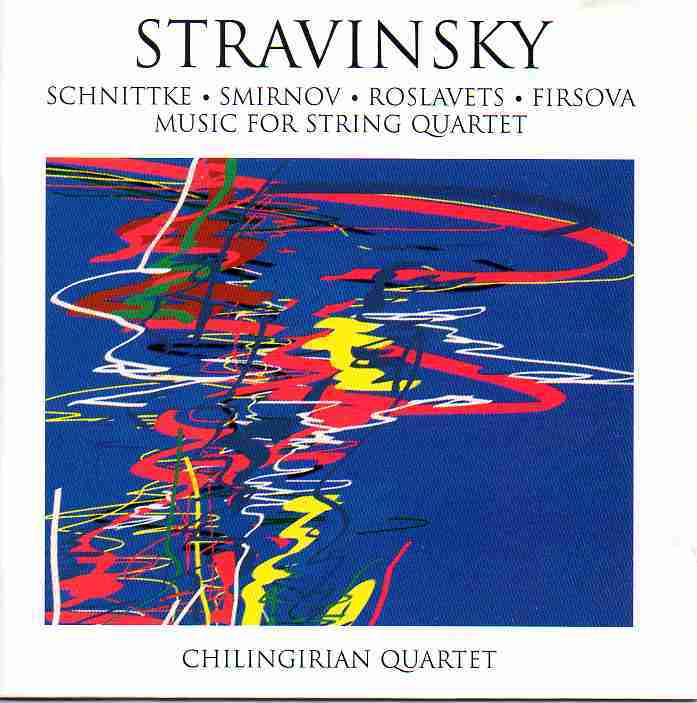 It is centered around Stravinsky (who gets the very large bold type on the CD’s cover) and his complete output in the genre, comprised of his witty and original 3 pieces for string quartet from 1914, his jocular and impertinent 1920 Concertino for String Quartet and the much later and terse Double Canon In Memoriam Raoul Dufy (1959). The Chilingirian Quartet’s reading is perhaps a tad to civilized and elegant in the two early pieces. With Alexander Mosolov, Nicolai Roslavets is an important but almost forgotten figure of early Soviet modernism. His short (12′) 3rd quartet from 1920 is couched in the international modernist idiom of the times, aggressive and stretching tonality but not dislocating it, close to Berg’s Quartet op. 3, Hindemith and Bloch. Despite its relative lack of a distinctive personality, it is interesting nonetheless for its documentation of a modernist trend within the early Soviet Union, which was stifled and sent to near-oblivion under Stalinist rule. No wonder Dmitri Smirnov‘s 2nd quartet and Elena Firsova‘s 4th share much in common, as they happen to by husband and wife. Among these shared features are a passionate angularity reminiscent of Berg and Schoenberg’s quartets, and a fascination with high-pitched violin melismata. 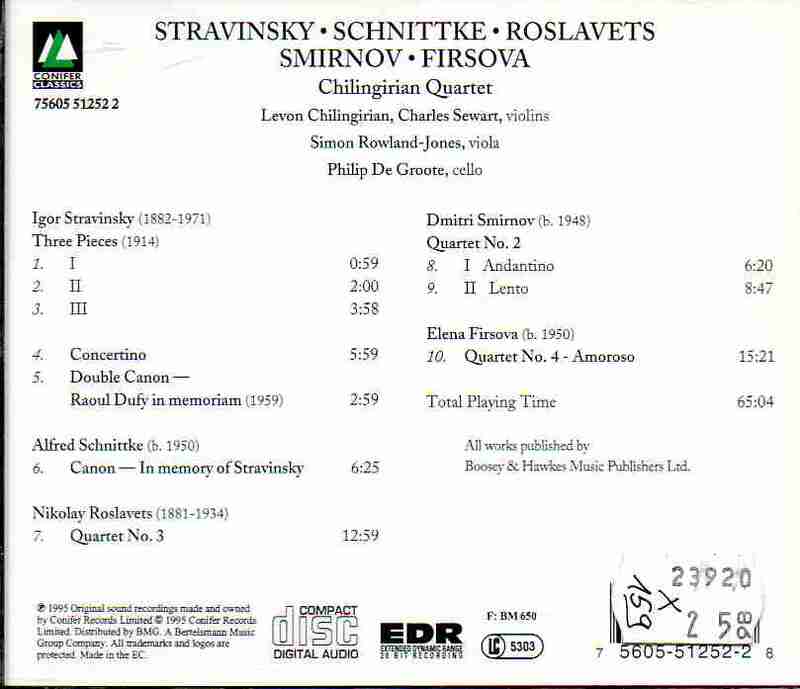 Smirnov‘s 2nd quartet was composed in 1985 and is dedicated to the composer’s younger son. In the first movement’s first section, the language is close to that of Berg’s Suite Lyrique, but more thorny and without Berg’s sensuousness. After 3 minutes of this knotty music, a slower and more original section sets in, based on a lullaby (actually Mozart’s “Schlaf, mein Prinzchen”, “Sleep, My Little Prince”, K550), with high-pitched melismata from the 1st violin reminiscent of Gypsy music, but that could be evocations of a child’s chirrupy babbling. The second movement is also a lullaby, sometimes vaguely reminiscent in its serene sentimentality of some adagio arias or duets from Strauss’ “Viennese” operas. 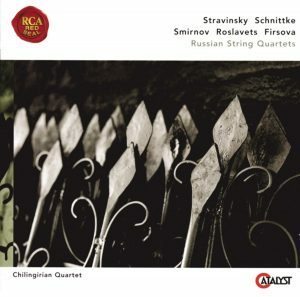 Its bareness is also vaguely evocative of some slow movement in Britten’s string quartets – but unlike Britten, I am not convinced that Smirnov transcends the almost kitschy simplicity of his base material, except in the final pages, with the enigmatic return of the same high-pitched melismata. I first encountered the music of Elena Firsova through the recording of her 3rd quartet “Misterioso” by the Lydian Quartet on an early MCA CD, “Lydian Quartet in Moscow“, and was greatly impressed with it. Her 15-minute long 4th quartet “Amoroso”, written in 1989 and dedicated to the same Lydian Quartet, is passionate in its first ten minutes but in a thorny and angular fashion reminiscent of Schoenberg’s later quartets even more than Berg’s, but a mood of mysterious serenity sets in after 10 minutes with a high-pitched duet of the two violins playing harmonics. Schnittke‘s Canon In Memoriam Igor Stravinsky is the best piece on this disc. With its simple gestures of searing intensity, it could have been written by the recently deceased, arch-maverick of Soviet music: Galina Ustvolskaya. 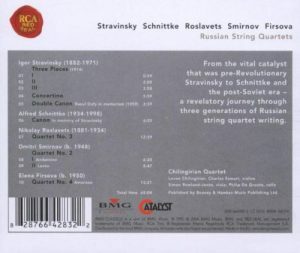 All in all, there are probably better introductions to contemporary Soviet/Russian string quartets (those of Schnittke and Gubaidulina are masterpieces), and I find the MCA disc with Firsova’s 3rd quartet a better introduction to this particular composer, though its couplings aren’t as coherent as here and its timing too short. But this disc is still a welcome addition for anyone seriously interested in contemporary Russian/Soviet music.